ET and Lawrence of Arabia on the big screen (plus, a giveaway!). NCM Fathom and TCM have teamed up once again to bring you two brilliant classic films on the big screen nationwide–and we have tickets to give away to each screening! First up, next Wednesday, October 3rd, Fathom and TCM (in conjunction with Universal Studios) will present a 30th anniversary screening of Steven Spielberg’s seminal childhood classic E.T. the Extra-Terrestrial (1982). The film has been newly remastered and will be introduced by TCM’s Ben Mankiewicz and one of the film’s stars, Drew Barrymore. For more information about this screening or to find a theater near you, check out the Fathom Events website. Then, on Thursday, October 4th, Fathom is partnering with Sony Pictures Entertainment to bring David Lean’s epic masterpiece Lawrence of Arabia (1962) to theaters for its 50th anniversary. The digitally-restored film will be presented in its original aspect ratio and will feature an intermission (a necessary inclusion, considering its length!). 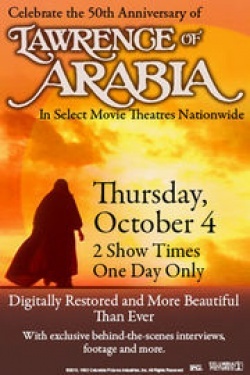 Arabia will be introduced by director/film historian Martin Scorsese and the movie’s Academy Award-nominated star, Omar Sharif. I cannot recommend these movies highly enough. E.T. simply represents childhood to many of us, and this is an excellent chance to take the children in your life to see this movie and allow them to experience the pure magic of Spielberg’s fantastic fable for themselves. And Lawrence of Arabia is one of those films that every self-respecting classic film fan should see–and to experience those gorgeous desert vistas on the big screen, where they belong? It’s a golden opportunity that can’t be missed. Note: Both events begin at 7PM local time. However, some locations may also feature matinee showings of the films. Check your city’s theater listings for more details. Are you itching to hit your local theater for one or both of these screenings? How would like to win a pair of tickets to one of these events? It just so happens that we are giving away three pairs of tickets to each of these films! To enter, simply send us an email to trueclassicsblog (at) gmail dot com with the subject line, “I want tickets!” Tell us which of these films you want to see, and we’ll toss your name into the metaphorical hat. Entries must be received by Saturday, September 29th, at 10PM CST. Winners will immediately be notified by email and will have 24 hours to respond before a replacement winner’s name is drawn. A double dose of Frankenstein (and we have tickets!). Win a TO KILL A MOCKINGBIRD prize pack!